Halloween | Ty Templeton's ART LAND!! 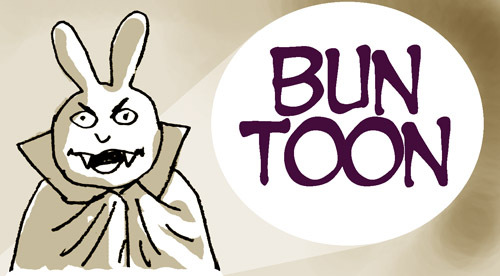 Spooky True Tales of Halloween Bun Toons! Boo! Scared ya, didn’t I? I’m doing a personal appearance at GOTHAM CENTRAL Comic Store in Mississauga this morning, so the Bun Toon is going to be a reminiscence of Halloweens past. For angry subscribers who did not expect a “encore performance” this morning, contact me directly: refunds are available after an exhausting and humiliating process. For those in the Toronto/Mississauga area, I’ll see you at GOTHAM CENTRAL in Mississauga!. Everyone else, enjoy the tricking treating. Back here NEXT WEEK with an all-new Bun Toon! I promise! For last week’s All-New ORIGINAL Bun Toon about Superman comics of the 1970s…click here. For the increasingly un-updated Bun Toon archive, click here!